Violet Fire: The color violet has long been associated with spirituality. Having the highest frequency in the visible spectrum, violet is at the point of transition to the next octave of light. To the ancient, this transcendental color was a spiritual rather than a physical phenomenon. Very good for cancerous conditions. Affects the skeletal system. Very good for Arthritis. Strengthens the body's abilities to assimulate minerals and vitamins. Very cleansing and purifying on physical and spiritual levels. It helps to balance physical and spiritual energies. Stimulates dream activities and past life memories. A great deal of information has been circulated about the Violet Flame through the writings of C.W. Leadbeater, Alice Baily, Benjamin Creme, Guy Ballard, Elizabeth Clare Prophet, and others. The Violet Flame is not new... although its name may be. The Violet Flame is a very specific kind of high frequency Fohat or Life Force Energy that comes to us from God, through the Holy Spirit. It is also known as "The Violet Flame of Forgiveness and Transmutation". The flame has the power to transmute or transform all forms of "negative" or "lower" energies into positive energy, and this includes the power to transform our personal karma. 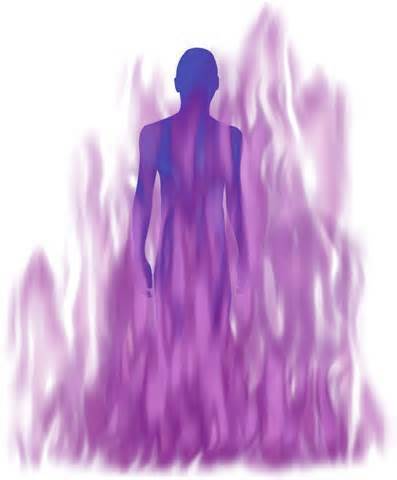 The Violet Flame unique energy is used to remove, transmute and cleanse negative energy with the physical body, mental and spiritual soul. St. Germaine and Archangel Zadkiel works with the violet flame for transformation, awakening, cleansing negativity, manifesting, world service, advancement of psychic abilities, accelerate Planet Earth into a Golden Age of freedom, peace, and enlightenment. Poor Decisions: Dissolves our negative karma due to past mistakes and gives us a clean slate to start again. Relationships: Brings harmony into relationships by burning away negative feelings that we feel about ourselves or our other people. Habits: Burns away negative habits and unwanted desires. Places: Used to help buildings, geographic locations , city or community.Friends and Family: Visualize the violet flame around them while you give the decree.